Polish rabbi; born in Posen, 1555; died at Ostrog Nov. 30, 1631. He was a son-in-law of Rabbi Moses Ashkenazi, author of "Zikron Mosheh." Samuel bears the name of his mother-in-law, Edel. In 1585 his wife's parents founded for him a large yeshibah, which was under his management until 1609. His mother-in-law supported the students out of her own money. In 1590 he was already recognized as an eminent scholar, and together with other rabbis, who were in convention at the city of Lublin, he signed the anathema against the use of money for the purpose of securing a rabbinical position. In 1610 he became rabbi of Chelm, which position he held with distinction for four years; he was then elected rabbi and head of the yeshibah at Lublin (1614). From Lublin he was called to Tictin (Tykoczin). During the remainder of his life Edels was rabbi and head of the yeshibah of Ostrog, in the Russian province of Volhynia. 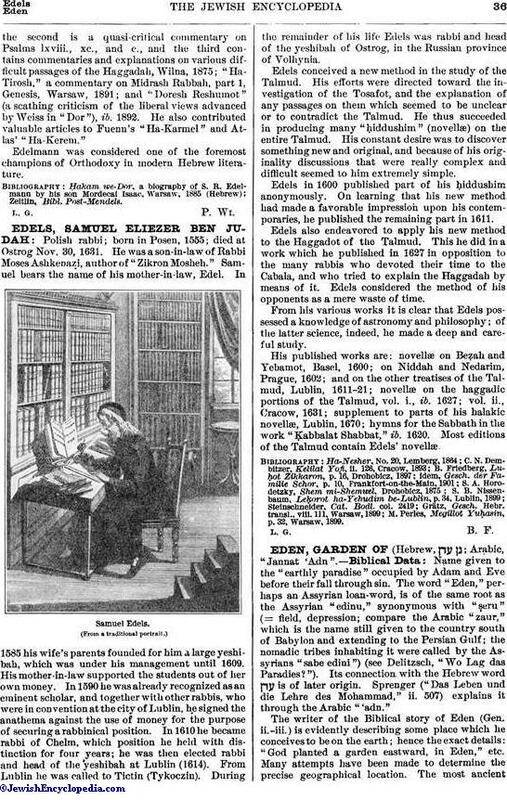 Edels conceived a new method in the study of the Talmud. His efforts were directed toward the investigation of the Tosafot, and the explanation of any passages on them which seemed to be unclear or to contradict the Talmud. He thus succeeded in producing many "ḥiddushim" (novellæ) on the entire Talmud. His constant desire was to discover something new and original, and because of his originality discussions that were really complex and difficult seemed to him extremely simple. Edels in 1600 published part of his ḥiddushim anonymously. On learning that his new method had made a favorable impression upon his contemporaries, he published the remaining part in 1611. Edels also endeavored to apply his new method to the Haggadot of the Talmud. This he did in a work which he published in 1627 in opposition to the many rabbis who devoted their time to the Cabala, and who tried to explain the Haggadah by means of it. Edels considered the method of his opponents as a mere waste of time. From his various works it is clear that Edels possessed a knowledge of astronomy and philosophy; of the latter science, indeed, he made a deep and careful study. 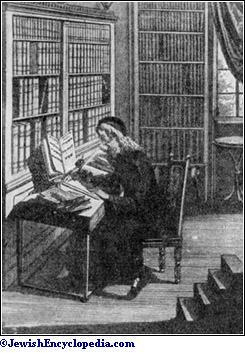 His published works are: novellæ on Beẓah and Yebamot, Basel, 1600; on Niddah and Nedarim, Prague, 1602; and on the other treatises of the Talmud, Lublin, 1611-21; novellæ on the haggadic portions of the Talmud, vol. i., ib. 1627; vol. ii., Cracow, 1631; supplement to parts of his halakic novellæ, Lublin, 1670; hymns for the Sabbath in the work "Ḳabbalat Shabbat," ib. 1620. Most editions of the Talmud contain Edels' novellæ. M. Perles, Megillot Yuḥasin, p. 32, Warsaw, 1899.